Below is the story of the Seneca White Deer by Chris Woloverton and a place to sign the petition to save them. This is another example of the wanton disregard of animals that are not valued by people. Money is the primary value of people. I am not saying that money should not be a concern. However, handing over an endangered population of white deer, who will surely meet their demise, is the hallmark of thinking that will eventually destroy the Earth. It will be a slow and agonizing death, primarily because it will never be recognized for what it is. How is it that people can be so calloused towards the plight of these precious deer? The answer is simple. They do not care about the suffering of animals that they eat and wear. They do not care about the suffering lives and cruel deaths of animals that someone else slaughters for them? Why, then, would they care about a few deer? They do not. Earth is the symptom. People are the disease. In the wild, the deer’s white coats leave them vulnerable to predators. The fenced-in depot allowed the herd to thrive for decades. If buyers remove the fence, the deer will likely be killed. 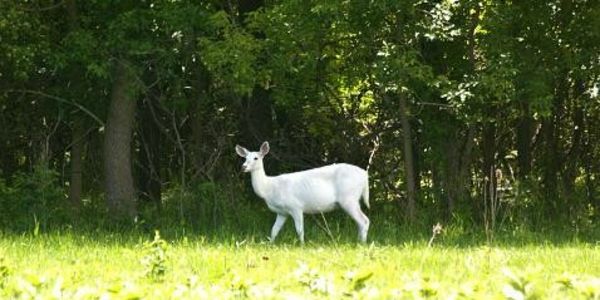 Tere Albanese has just read and signed the petition: Save the Seneca White Deer! will you join Tere in signing? ThePetitionSite.com provides tools and empowers individuals to make a difference and create change through online activism. Want to start your own petition? Get started here. ThePetitionSite.com is powered by Care2, the largest and most trusted information and action site for people who care to make a difference in their lives and the world. want to keep making a difference in the world? Author Justamis2015Posted on February 10, 2016 December 3, 2016 Categories Animals in the News, Political BlogsLeave a comment on Save the Seneca White Deer! America’s only wild jaguar caught on video! To see this amazing video Click Here to go to Michael Casey’s page on Fox News. Scroll down to see the video. This is amazing! These big cats are so rare and so elusive, it’s a miracle that one, in fact the only one in America, was caught on tape. His name is El Jefe, which means “the boss” in Spanish. It must be said that a paramount reason that these native big cats are gone from America, as well as other areas around the world, is because of ranchers that have killed them off so they could secure grazing lands for animals that are slaughtered for human consumption. The entire ecological equilibrium is vastly off kilter due to an unnatural amount of food raised and killed for an enlarged and ever-growing population. In the end, all species suffer. Unfortunately, the odds are against El Jaffe’s survival. It’s not grazing this time. Read El Jefe’s story. In a video released Wednesday by Conservation CATalyst and the Center for Biological Diversity, the jaguar can be seen walking through a forest and across a stream in the Santa Rita Mountains just outside Tucson. Related: How a Great Wall of America could seal fate of border’s endangered species (and us, too)Jaguars, which are the third-largest cats in the world after tigers and lions – once lived throughout the American Southwest, with historical reports on the South Rim of the Grand Canyon, the mountains of Southern California and as far east as Louisiana. But the endangered cat has gradually disappeared from its U.S. range over the past 150 years, mostly due to habitat loss and hunting efforts at the behest of the livestock industry. CATalyst and the Center for Biological Diversity are hoping the video motivates officials in Arizona to offer greater protection to jaguars as well as ocelots. The hope is that El Jefe will be joined by other jaguars that wander up from Mexico, a goal that increased in likelihood after the Center helped secure more than 750,000 acres of federally protected critical habitat for U.S. jaguar recovery. El Jefe has been photographed repeatedly by remote sensor cameras in the Santa Ritas over the past few years. He is the only verified jaguar in the United States, since Macho B was euthanized as a result of injuries suffered in March 2009. The confirmed presence of El Jefe could help rally opposition against a huge copper mine in the area being proposed by a Canadian company. Opponents of the mine fear it could permanently destroy thousands of acres of federal protected jaguar habitat while supporters said it could give a much needed boost to Arizona’s economy – which has long depended upon mining. Author Justamis2015Posted on February 3, 2016 December 4, 2016 Categories Animals in the NewsLeave a comment on America’s only wild jaguar caught on video!